I’m a psychology major, but I’m also someone who has spent a good amount of time in therapy. As such, I’ve found a good number of psychological concepts incredibly useful in my daily life, and reference them in therapy all the time. Ask my therapist (or honestly, anyone I know), and they’ll tell you my favorite psych law is the Yerkes-Dodson law of 1908. So, first, what is the Yerkes-Dodson law? 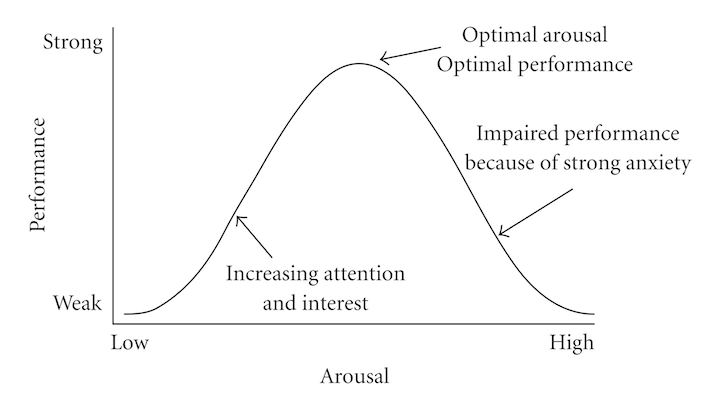 The Yerkes-Dodson law dictates how performance is affected by arousal (in an emotional sense, similar to how “amped up” you are, rather than sexual arousal). The law states that, generally, how well you do at a task increases with your arousal to a certain level, at which point it begins to decrease as arousal decreases. In short, the Yerkes-Dodson law states that your peak performance comes at about a middle-of-the-road level of arousal. This phenomenon can be described using a bell curve. Why does it matter? And how does it apply to students? In therapy, I’m constantly tackling all-or-nothing thinking. I’ll often come in complaining that I’m too anxious to get anything done on the far right of our bell-curve, but am terrified of slipping down the other side, of falling to sub-optimal performance because I’ll have “fixed” my anxiety. I attach my high anxiety, my worry about school and grades, to how well I perform, and then get worried that if I let go, I’ll fall to the complete opposite, and fail to achieve in the way I’m used to. In reality, à la Yerkes-Dodson law, the best place to be is somewhere in the middle. You’ve got to care about what you’re doing to do well in it and pay attention, but high levels of anxiety don’t actually help you, they hinder. 1. Don’t fall into my “all-or-nothing” trap. If you’re like me and feel like you need high levels of anxiety to keep performing at the same level, read up on the Yerkes-Dodson law! Backed by research, it’s simply not true. You’ll do best if you take care of yourself and find a happy middle. I promise you won’t slide the other way down the curve; people don’t change that much in short periods of time! If you have high trait anxiety like I do, it’s pretty hard to stop caring and worrying all of the sudden. 2. If you want to do better, get yourself to care. This sounds stupid, I know. But perhaps you’re at the low end of the spectrum about a certain topic. We’ve all had a class we don’t care about, and therefore don’t do as well in. I do my best to channel anxiety/arousal from other aspects of my life into courses that I genuinely don’t have the motivation to work towards. Injecting a bit of my anxiety into classes that are harder to get motivated for usually helps a bit. And hey, if that doesn’t work, read up on another great behavioral concept: positive reinforcement. Try rewarding yourself for the effort that you put in, it’ll increase your motivation to continue the behavior! 3. Do your best to keep your anxiety levels in check. What does this mean for me? It means cutting short my nights in the library, it means getting enough sleep and food, regulating myself in as many ways as I can. For me, the Yerkes-Dodson law proves that staying up all night just isn’t worth it- the impacts on my mental health just won’t balance out with the information gained. It might be worth it to check out tips for dealing with anxiety, like these mindfulness strategies. So, best luck of finals, everyone! Let me know how the Yerkes-Dodson law affects your study habits! Postpartum anxiety is very common, and may be accompanied by panic attacks. These terrifying experiences are also highly treatable. Understanding what causes, contributes to, and alleviates postpartum panic attacks is an empowering first step. Here are seven helpful things to know.